Like other recruiting firms, HireMinds in Kendall Square is having trouble finding candidates for tech jobs. As he does most mornings, headhunter David Freier began a recent workday by hitting the phones. 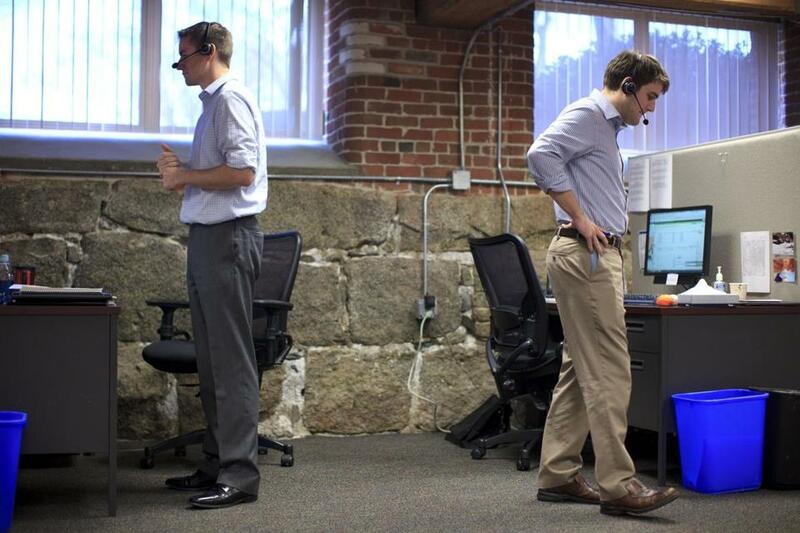 His target this day: finding a software ­engineer for a growing start-up in Cambridge. By the afternoon, he had dialed about 150 numbers and had mostly gotten voice mailboxes, or people who just hung up on him. In the end, he had scrounged up just four qualified — and willing — candidates. Headhunters such as Freier are madly scrambling to find enough talented engineers and developers for their clients — fledgling start-ups and established companies alike. The clients are so desperate to fill jobs they are piling on the pay and the perks for qualified candidates. Those fresh out of college can start at $75,000, and seasoned developers are earning $140,000 annually. And salaries in the industry continue to soar, up by as much as 15 percent this year. iPads, and iPhones; at some start-ups, even the cold beer is on the house. “It’s what you have to do to compete,” said Hemant Chowdhry of Alere Wellogic, a Waltham electronic health records company that is looking to hire 45 people — from Java engineers to mobile developers — in the next few months. With fewer candidates available for such specialized positions, Chowdhry said, employers are frequently in bidding wars for the brightest contenders. And naturally, the subjects of all this attention take advantage of the situation. “Job seekers are also feeling their oats. They know now that they are in a powerful position,” said David Hayes, president of HireMinds , a Cambridge tech recruiting agency that is working to fill positions at Alere Wellogic. In some cases, Hayes said, young techies are so confident that they have no qualms about telling their current managers they are looking to leave — certain they will find something better. Driven by a proliferation of start-ups and the expansion of West Coast stalwarts such as Amazon.com and PayPal to the Boston area, employment in the local tech sector has grown 7 percent in the past year, well beyond the general economy’s gain. On a typical recent day, there were more than 3,500 job openings at Boston-area companies on the tech-based career site Dice.com. Though figures are not available for Massachusetts specifically, the national unemployment rate for tech workers across all industries is just 3.2 percent, compared to the overall jobless rate of 7.9 percent. And as wages rise for new talent, so does the cost of finding them. David Hayes, president of HireMinds, chatted with search consultant Breeana Cebula. The headhunting agency is currently trying to help Alere Wellogic fill its open positions. Typically, headhunters charge about 25 percent of a hired employee’s starting salary as a finders’ fee. At HireMinds, ICI Software Recruitment, and other firms, hiring requests are up more than 20 percent this year. The lure of a big payday has produced its own boomlet in the recruiting industry — to the point where there are so many new headhunters making the same rounds of cold calls that the recruited are starting to resent all the attention. “It’s kind of annoying, actually,” said Jillian Kando, cofounder of CraveLabs Inc., a Cambridge software start-up. Adam Machanic, a database administrator at a Boston ­financial-services firm, limited his availability on the professional networking site LinkedIn, to lessen the onslaught of recruiters. But no matter how much he rebuffs their calls and ­e-mails, they keep coming. The situation hasn’t gotten so desperate that employers are hiring just any warm body. Companies are trying to be as choosy as the candidates are in filling jobs. At Rapid7 Inc., a Boston network security firm, the company’s five full-time recruiters concentrate on candidates who are already in demand: industry veterans who are currently employed or those computer science graduates being pursued by multiple companies. “We dig really, really hard to find people,” said Christina Luconi, the chief people officer at Rapid7. With so much money and time invested in each hire, companies are often subjecting candidates to a rigorous trials involving multiple interviews, on-the-spot coding, and real-time problem solving. “Part of the job is breaking hearts,” said Leslie Mitchell, recruiting manager at HubSpot Inc., a Cambridge software firm that has added more than 100 employees in the last year and doubled its recruiting staff. But with the job climate still favoring the applicant, companies are finding it’s a fine line between being demanding and pushy.